Choose the perfect material for your counters. Whether they are in your kitchen or master bathroom, countertops need to be made of a material that is long lasting and aesthetically pleasing. Granite countertops are a modern fixture in any home and turn any room into a more welcoming space. 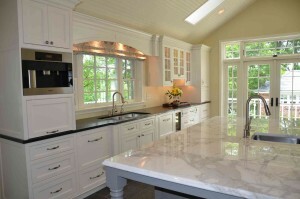 Granite is one of the more popular natural stones that are installed as countertops. Today, homeowners choose granite more frequently for their homes and reap the numerous benefits almost immediately! Granite is one of the hardest stones on the market and is perfect for messiest chef in the kitchen. The stone is difficult to scratch or chip, so you will never have to worry about calling a contractor to repair your countertop. To extend the life of your granite counters, all you have to do is apply a sealer. A sealed granite countertop is not porous, so it is resistant to bacteria and other dirt. Kitchen clean up is made simple with a granite countertop and spills only need to be wiped up with a warm wet towel. Granite countertops are perfect for families of anysize because they are so durable against a variety of forces. Kitchens infused with granite are suitable for children who love to help you cook. Even if they something or bang a pan against a counter, granite will keep maintain its integrity. Granite countertops are ideal for any cook from the beginner to the professional. When guests walk into your kitchen or bathroom, they will instantly notice the beauty of your granite countertops. The natural pattern and look of granite will elevate any room it is installed into and make your home more inviting. Granite countertops are perfectly flat so they are ideal for cooking and baking. The best surface for rolling out dough and preparing baked goods. This entry was posted on Friday, August 11th, 2017 at 4:00 pm. Both comments and pings are currently closed.